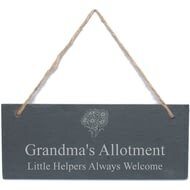 Personalise this Slate Sign with 2 lines of text up to 30 characters per line. The slate plaque has a piece of natural, rustic string which enables this item to be hung up. 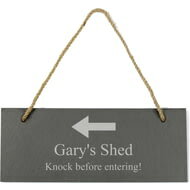 Personalise this Slate Hanging Sign with a message over 1 or 2 lines. All text will be centrally aligned. If you require UPPER CASE, please enter in this way when ordering. Personalise this Life is Great Slate Rectangle Cheeseboard with 2 lines of text of up to 20 characters that features at the bottom of the design. 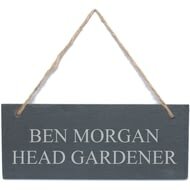 Personalise this Flower Motif Slate Sign with one line of 25 characters, and one line of 40 characters for a longer message. Above the personalisation is a cute flower motif. Personalise this Mr & Mrs Slate Cheeseboard/Placemat with the couples names up to 30 characters and date up to 20 characters. 'Mr & Mrs' is fixed. 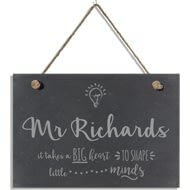 Personalise this Tool Motif Slate Sign with one line of 25 characters which will be in bold, and one line of 40 characters for a longer message. A rustic slate clock, ideal for someone who has just bought a New Home or for the lucky couple who have just got married! 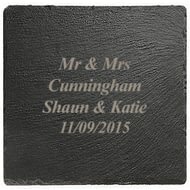 Personalise with title or names up to 8 characters each. 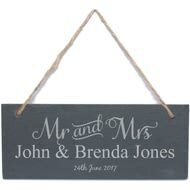 Personalise this Mr & Mrs Door Plaque with a couples surname up to 15 characters and date up to 20 characters. 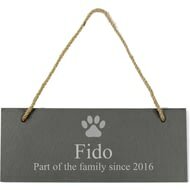 Personalise this Paw Print Motif Slate Sign with one line of 25 characters, and one line of 40 characters for a longer message. Above the personalisation is a cute paw print motif. 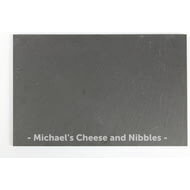 Personalise this Slate Cheeseboard over 2 lines up to 30 characters per line. Each board has pads on the underside to protect the surface they are placed on. 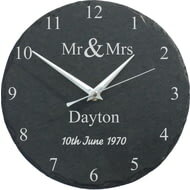 A rustic slate clock, perfect for any occasion! 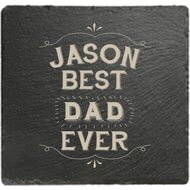 Personalise with two lines of text at the top and 4 lines below. Personalise this Slate Cheeseboard or Placemat with with one line of 40 characters. 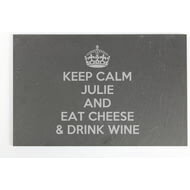 Personalise this Keep Calm Slate Rectangle Cheeseboard with a name up to 30 characters and message over 2 lines up to 30 characters per line. Personalise this Slate Hanging Heart with 4 lines of 15 characters in the centre of the heart. Personalisation will be appear as entered and will be centrally aligned. 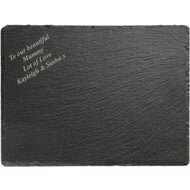 Personalised this natural slate board with any message over 4 lines up to 20 characters per line. 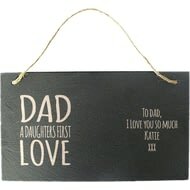 A perfect way to show your Dad that he's a Daughter's First Love! Make this glass even more special by including your very own personalisation. 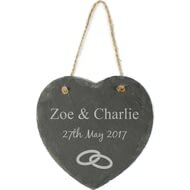 Personalise this Slate Hanging Heart with three lines of 15 characters in the centre of the heart. 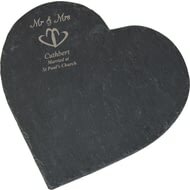 The design features joined wedding ring motif at the bottom of the slate heart. 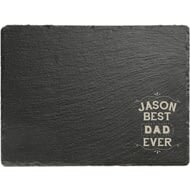 This square slate coaster makes an ideal addition to any coffee table. 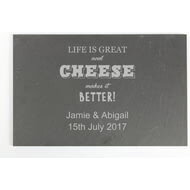 It's a cheesy gift but it'll make them feel grate! 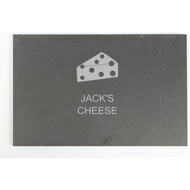 As we get older gifts seem to become more practical, but this cheesy wonder is also a fun addition to their home. 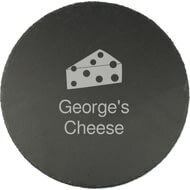 Personalise this Round Slate Cheeseboard over 2 lines up to 30 characters per line. An engagement is a promise to agree to spend a life together so give them something they can cherish and use as they live that life. Wedding vows are a promise to spend a life together so give them something they can cherish and use as they live that life. Colleagues come and go throughout a working life, but it's nice to show they were appreciated whilst they stuck around. Chilli and Bubbles are here to help you to always remember to say cheese and thank you! Made from slate, this rectangle board would be the perfect gift for any occasion. 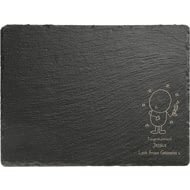 For the guy's that love to cook, this board is an ideal addition to their kitchen. 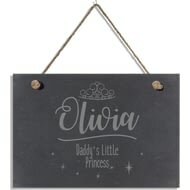 Add your chosen name of up to 15 characters above fixed text ‘Daddy’s Little Princess’, to let your daughter know how much they mean to you. This hanging slate sign measures 18cm wide and 13cm tall and would make the perfect addition to any couples home. Looking for an end of term gift or a gift for Christmas? Look no further than this hanging slate sign. 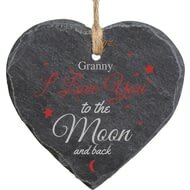 Their name is included within the design on the front of this loving heart-shaped slate hanging sign showing them you love them to the moon and back. To commemorate an occasion for a special someone, or to buy as a bespoke cheeseboard this stylish slate heart cheeseboard includes your message lasered onto the quality slate. 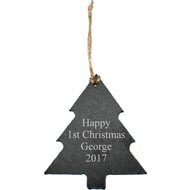 Personalise this Slate Christmas Tree Decoration 5 lines up to 12 characters per line. 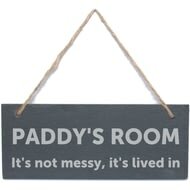 The decoration has a piece of natural, rustic string which enables this item to be hung up. Wish a jolly Christmas in a more unique way this year with this bespoke Chilli and Bubble's slate cheeseboard. Give a festive hug that lasts on this bespoke Chilli and Bubble's slate cheeseboard.